But no matter what’s been tried, imitations cannot match the Original V-Slicer from Börner. 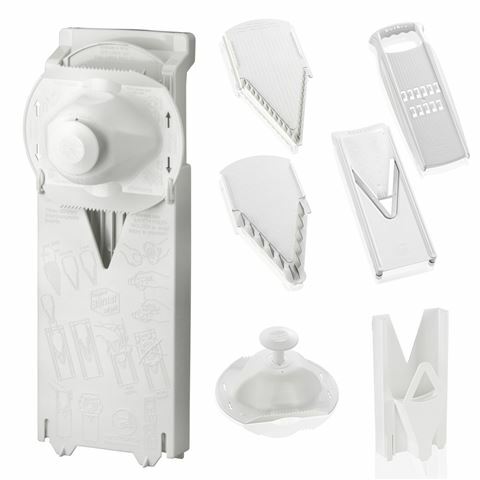 This is the tool that made slicing and shredding easy again – with no knives involved! Still made in Germany and still helping people out in the kitchen, this is the indispensable slicer that just about every kitchen can appreciate. This Original model includes a thick-thin slicing insert and two Julienne inserts, as well as a safety attachment that lets you grip foods safely as you work. Just run your vegetable or fruit over the razor-sharp stainless steel blades and effortlessly get done what has been a chore in the past. With a super stable frame construction, a durable nature and safe operation, there’s a reason why the original is always the best! Super-strong and stable ABS plastic frame. Blades made from sharp stainless steel. Storage box allows the V-Slicer to be stored safely on your wall, or stand up on your bench or in a cupboard. Ergonomically designed for comfortable use. Includes a food grip to protect hands while grating or slicing. Storage box is equipped with a child lock for safe storage. Includes a bonus rosti attachment. Original V-Slicer with Thick/Thin Slicer Insert.